M.Ch - Neuro Surgery, MS - General Surgery, M.B.B.S. 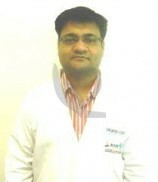 Dr. Nitin Yogesh, MBBS, MS (General Surgery), M.Ch(Neurosurgery), is a Consultant Neurosurgery & Spine Surgery at Max Superspeciality Hospital, Mohali. Prior to that, he had career stints as Consultant Neurosurgery at Government Medical College & Hospital, Chandigarh & Fortis Hospital, Mohali. Dr. Yogesh is an alumnus of Bangalore Medical College & Research Institute, Bangalore from where he completed his basic medical studies(MBBS). Thereafter, he went on to complete his post graduation in General Surgery followed by super specialisation in Neurology from the premier institute, PGIMER, Chandigarh. Besides, he has also attained Fellowship in Spine Surgery from the Rush University, Chicago & Fellowship in Endoscopic Neurosurgery from France. To his credits, he has been honoured with best poster award, ASICON in the year 2005 & Best paper award, NSI in the year 2006. Being a member of various professional societies, he actively participates in conferences and workshops of his professional domain to hone his practical skills .